Years ago Chef Eric Ziebold ventured out on his own from the storied halls of Thomas Keller's The French Laundry and Per Se to create his own Modern American cuisine at the exquisite CityZen in Washington, DC. Three years later he was named one of the "Ten Most Influential Chefs Working in America" by Forbes. 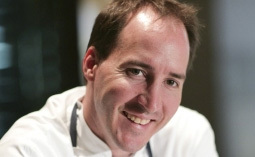 In 2008 he was recognized by both the James Beard Awards and The Restaurant Association of Metropolitan Washington as Best Chef: Mid-Atlantic Region and Chef of the Year respectively. Chef Ziebold's dinner will be elegantly paired with wines by Hundred Acre, Layer Cake, Cherry Pie, and Hundred Acre Fortification Port; joined by owner and maverick vintner of Napa Valley, Jayson Woodbridge. $100 per person for dinner and $50 for wine pairings. Excludes tax and 20% service charge. This exclusive event will sell out, so please call soon for reservations at 310‑545‑7470. After subscribing, please check your inbox for a confirmation email.